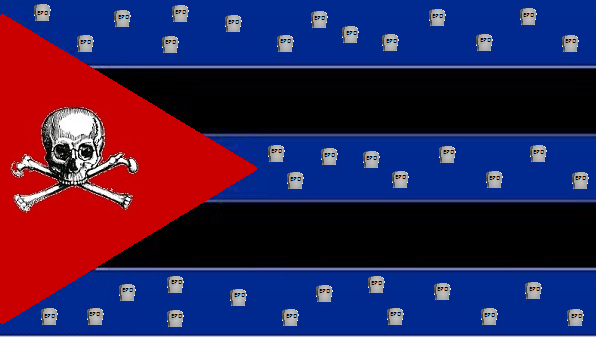 Proposed flag for Castro Incorporated. Over the past few weeks many, especially in Venezuela, have focused on the role of the Castro regime and its intelligence service in shoring up the Maduro regime and speculated about its protagonism in the killing and torture of Venezuelan students. Tens of thousands of Venezuelans took to the streets to protest the Castros' interventions in the internal affairs of Venezuela. The harm done by this dictatorship is not limited to Latin America but spans across the globe undermining human rights, dignity and freedom since 1959. 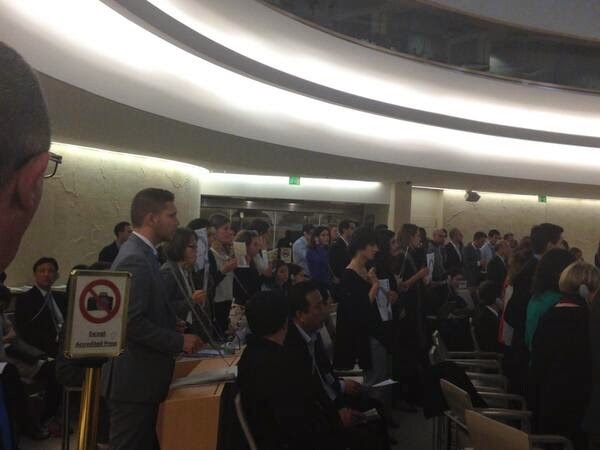 Meanwhile today at the United Nations Human Rights Council the Castro dictatorship applauded the human rights record of the People's Republic of China, and voted to block the effort of human rights defenders to hold a moment of silence for Cao Shunli. 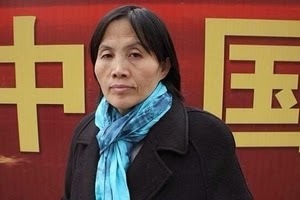 She was an activist who had tried to participate in China’s Universal Periodic Review, but was detained at the airport trying to get on a flight to attend the current session of the UN Human Rights Council in Geneva and accused of "picking quarrels and provoking troubles." Within three months in detention and being denied medical care Cao Shunli died on March 14, 2014. The behavior of the Cuban government is not a surprise. Their is a long track record going back decades. During the first Universal Periodic Review of the People's Republic of China in 2009 the Castro regime recommended that China take a harder line against human rights defenders. Representatives of the Castro regime also defended North Korea against a critical United Nations human rights report claiming that it harmed prospects for dialogue. At the same time the close relationship between Cuba and North Korea and the smuggling of arms in violation of international sanctions has also been in the news. The Castro regime also involved itself in Ethiopia with a close ally, Mengistu Haile Mariam, who is now a convicted war criminal who they guided in a red terror that killed scores of children considered ideologically suspect in Ethiopia. Cuban diplomats for the dictatorship played a crucial role in blocking a UN investigation of atrocities in Sri Lanka. Despite being in charge of a small country that often talks about the sovereignty and self-determination of peoples facing a great empire (i.e. The United States) the plight of the people of Tibet does not interest the Castro brothers. (Nor did the Soviet invasions of Czechoslovakia in 1968 or Afghanistan in 1979. The Cuban dictatorship openly applauded the massacre of Chinese students in Tiananmen Square in 1989 commending Chinese authorities for "defeating the counterrevolutionary acts." This should answer the question about their possible involvement or advocacy of such practices in Venezuela. However, ideological litmus tests have not limited the Castro brothers embrace of gross and systematic human rights violators. Formerly classified documents made public by the German intelligence service in November of 2012 reveal that Fidel Castro in the 1960s personally recruited former Nazi SS Waffen members to train Cuban troops and also reached out to Nazi operatives, Otto Ernst Remer and Ernst-Wilhelm Springer, in Germany's extreme right to purchase weapons. In the 1970s the Castro regime developed a close relationship with right wing military junta in Argentina that had disappeared, according to some estimates, as many as 30,000 Argentinians many of whom were leftists. 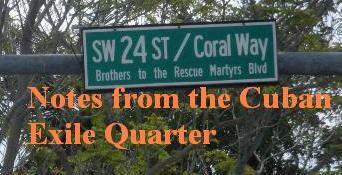 The Castro brothers have also defended the Assad regime for years at the United Nations, and looked the other way when the United States set up its prison camp in Guantanamo. The one Cuban dissident, Oswaldo Payá Sardiñas, who first criticized the presence and treatment of inmates at Guantanamo was murdered by agents of the Castro regime on July 22, 2012.